Not long ago I showed you my progress of my Christmas town. I would like to show you more progress, as it has gone quite fast since last time. The main reason for this is that I celebrated my birthday in between then and now, and I was so lucky as to get a Daylight StitchSmart Stand and Accessory Pack from my fiancé and my parents! It is so much easier to stitch when I can use both hands. It is also a lot easier to handle, as it is quite a big frame and now I can stitch without having to fiddle around with it. 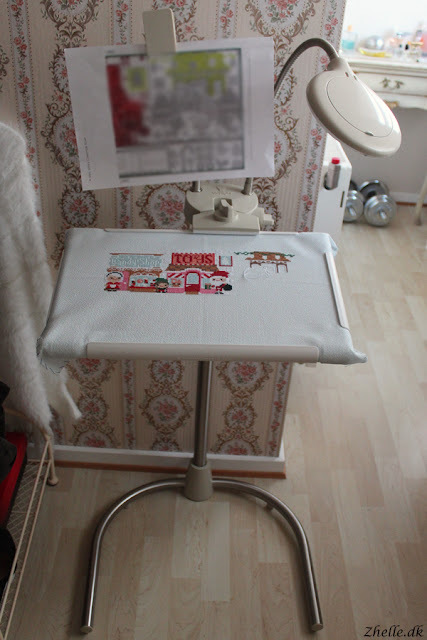 I can also stitch anywhere where there is a wall socket, as my new lamp that goes with the stand will light up my stitching perfectly! No more sitting awkward places because thats where my table lamp can stand.